Every year, we get to watch a series of commericals interspersed with occasional shots of people running into each other. 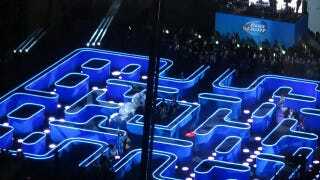 But for this year's Super Bowl commercial, Bud Lite has upped the ante: it's built a life-size Pac-Man game. As I4U have noticed, a few photos of the maze have been surfacing on Twitter and Facebook. It's definitely a Pac-Man game, complete with light-up walls, jellies, and apparently, one poor victim actor trying to escape, presumably thanks to the jelly-melting magic of Bud Lite or something.